I've been working on something since New Year's Day. I've shared a bit with y'all about my personal struggle to regain control over anxiety through diet and exercise Not that I'm a fitness fan or anything like that. However, when life takes a nose dive and your sense of security and well-being starts to disappear, the pain and ensuing panic can force some much needed change in lifestyle and daily routine. Even if you're 50 something and completely out of shape. It can happen. A big part of my lifestyle change is riding a bicycle . Last spring I could barely ride one mile. It was hot and scary and exhausting. But guess what? By focusing all that excess stress and nervous energy on the bike and literally "riding it out", the anxiety began to subside. It was replaced by a sense of well being and accomplishment. I rode nearly every day and set a goal to join a local 10 mile bike ride event last summer. After that the confidence increased and the anxiety waned. I began riding the bike to work occasionally- 10 miles each way. I decided to enter that local bike ride again and increase the distance from 10 to 27 miles. Towards the end of the year I was losing some momentum and struggling to find some motivation. The daylight hours were too few to ride to work. It was nearly dark by the time I got home each evening. I thought about setting a new goal - a really big, year-long goal. A thousand mile goal. Wow. A thousand miles is a long long long ride. No, I'm not riding from Texas to Utah. No, I'm not taking time off work to do it. This has to fit my schedule and be realistic. I won't ride on Sundays either. I have 6 days a week to ride. I can do it right here on my own street. A thousand miles sounds easier when broken into segments. It is a bit less than 20 miles each week for the whole year. Yep, that is definitely doable. I rode 8 miles after work today, making the year-to-date total 196 miles. I'm trying to BEAT 20 miles per week. Thus far I've been riding 26 miles per week. The daily and year-to-date progress is recorded on the calendar. Sharing this very personal journey because I hope to inspire others. No matter who you are or where you are on your journey right now, there is hope. You can overcome obstacles. If I can do this, anyone can. 804 miles to go. Ride on! A couple of years ago, my generally stressful life became much more stressful. Stressful events began happening back to back, then they started to snowball on me. Finally, my body began to break down. I could no longer manage the stress by myself. Anxiety attacks? Could a control freak like me truly be unable to control her own stress levels and experience a full blown anxiety attack? Yes. It happened. I didn't want to admit it, but it happened. HUBBY took me to the ER...and they gave me something I really hated to help control the anxiety - prescription medication. No way I could live the rest of my life popping pills to control my stress. No way. After much deliberation, searching, and prayer, I found a doctor who could help. Once thorough testing was completed, she prescribed thyroid medicine and bio-identical hormones, drastically changed my eating habits, and told me to begin regular walking and yoga. I was ready to try almost ANYTHING to avoid anxiety attacks and those awful pills. Walking? I started walking about a mile each day. I've never been much of a fitness buff. Can't run very fast and just not very good at most sports. I could walk, but it wasn't much fun. In fact, walking was boring. Finally, HUBBY and I started talking about bicycles. As a kid, I used to love bicycling. We had a small collection of bikes in the barn. He selected an old Huffy Roadmaster mountain bike and fixed it up for me. March 2015 was the beginning of a very positive change in my life. At first, I could only ride about a mile or so on that bike. I was 54 years old and more than a little afraid of breaking something - like a leg or an arm or worse. I started bicycling every other day or so - and gradually built up my strength and endurance level. The stronger I got, the less fearful I became about riding. Pretty soon I could go halfway up a big hill at one end of our street. Not too long after that, I could go halfway up the hill, back down to the lake, and home again. Gradually, I was able to go ALL the way up that big hill, down to the lake, and back home - a distance of about two and a half miles. Well, if I could do that route once, maybe I could do it one and a half times. Pretty soon I could do two rounds. I referred to it as two laps. Wow, two laps was equal to five miles! Summer was fast approaching. It was getting hotter in Texas and climbing that big hill twice was not easy. By early May 2015, I got a water bottle and holder for the bike. That helped a lot. 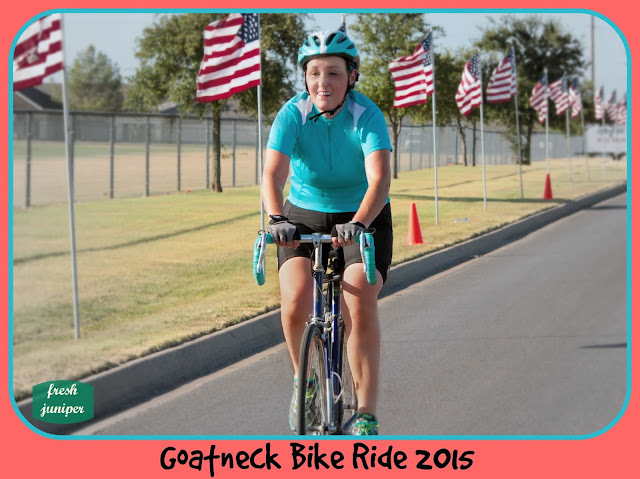 Near our home, there is a popular annual bike event each summer called the Goatneck Bike Ride. The 2015 Goatneck was scheduled for July 25, two days before my 55th birthday. As I stated earlier, I'm not an athletic-type person. I've never done any kind of organized bike ride in my life. But I started thinking to myself, "If I can do two laps (five miles) then maybe I can do three or four laps. I wonder how long the Goatneck Bike Ride is this year?" I looked it up, and the Goatneck Bike Ride has four different choices or divisions. The options for rides were ten miles, twenty-seven miles, forty-one miles, and seventy miles. Could I do ten miles? Four laps would equal ten miles. The wheels in my head started turning. I'm a Grandmother of six. Could I really do a ten mile bike ride? What if I failed - or had a collision with another bicyclist? What if I could actually complete it? I prayed a lot. God gave me strength and courage. The excitement built as I increased the distance to three laps (seven and a half miles). The Texas summer was upon us and it was getting hotter. Finally I could do four laps. It wasn't easy on that old Huffy! I looked over the Goatneck route map and decided to give it a try before the race. HUBBY was so supportive. He drove me and the bike to the starting point, then drove ahead a short distance to wait for me. As I passed him, he'd get back in the truck and drive ahead a little farther to wait. I'd pass him again and he'd drive a little further ahead. Bless his little pea-pickin' heart. He knew I was still nervous about it and he made sure I knew he'd stay nearby in case anything went wrong. Sure enough, I finished the ten mile ride on that Huffy. Whew, I finally knew I could do it! It took me a little over fifty minutes. I felt pretty good about my goal to ride Goatneck that day. During the next week, HUBBY pulled PRINCE's Bianchi bicycle out of the barn and began working on it. He asked me to try it out. We'd been to some bike shops looking for ways to modify the Huffy and make it easier to ride. Bike shops call the HUFFY Roadmaster Mountain Bike "an ironing board with wheels". They also told me that in any bike event, mountain bikes finish last. There wasn't any modification that would help it - or me. Reluctantly, I agreed to try riding the Bianchi. It was a TALL bike. After riding it for the first time, I realized I would NOT ride the Huffy in the Goatneck 2015 Bike Ride. The Bianchi bike was so much EASIER to pedal, especially up that BIG hill on my regular practice route. I continued to train with the Bianchi, riding my four laps every other day or so. It was getting even hotter outside and some days it was tough to finish - particularly if it was windy outside. We decided to do one more practice run of the actual Goatneck ten mile route, this time on the Bianchi. My courage had increased. I asked HUBBY to go farther ahead to wait for me to pass him each time. Riding the route on the Bianchi was so much more fun. It helped trim the ride time down to about forty-five minutes. My excitement continued to build. HUBBY helped me shop for a new helmet, bike shirt and shorts, gloves, and tennis shoes. Never before did I understand why bicyclists needed gloves. It is to be able to grip the handlebars when your hands get sweaty. I registered online for the Goatneck Bike Ride about three weeks prior to the ride. About one week before the ride I picked up my packet at the designated bike shop. The day I'd anticipated for months, July 25th, finally arrived. We woke up early, got the gear ready, and loaded the bikes into the truck for the trip into town. The Goatneck always starts and finishes at the high school. The seventy mile ride began first at 7:30 a.m. The forty-one mile ride began at 7:40 a.m. The twenty-seven mile ride began at 7:45 a.m. My ride, the ten mile, was set to begin at 7:50 a.m. I think it was about 7:55 or so when it actually started. Off I went with lots of other bicycle riders. This was new to me. I was accustomed to riding solo. It was fun seeing all those people riding along enjoying themselves. Although the Goatneck Bike Ride is NOT a race, I wanted to improve my time. It was a thrill for me to challenge myself and try to do better. I finished at the Goatneck 2015 ten mile bike ride at 8:23 a.m. This time it only took about thirty minutes, a new personal best! Happy birthday to me!! I'm so grateful to my Heavenly Father for answering my prayers and helping me realize this dream, to HUBBY for working so hard and spending so much time to repair the bikes and buy the gear, and to PRINCE for letting me ride his Bianchi bicycle. Although the Goatneck 2015 is over, I still ride the bike a few times per week. My new goal is to be able to complete the twenty-seven mile ride for Goatneck 2016. I share this very personal story in hopes of inspiring others who are having trouble with anxiety. Riding the bike has really helped me to deflate my stress. At the end of each ride, I feel less anxious and much more joyful. If the anxiety is really bad, I ride till I'm just too tired to feel anxious about anything. I'll share more about the rest of the treatment plan - the diet change and prescription treatments - in future posts. I've lost about 35 pounds and gained strength, endurance, confidence, and muscle tone! My daughter, the very pregnant lady in the tan stripe sweater, has some wonderfully talented friends. I was privileged to attend her baby shower recently. The hostess, seated just to the left of my daughter, put on a terrific event. 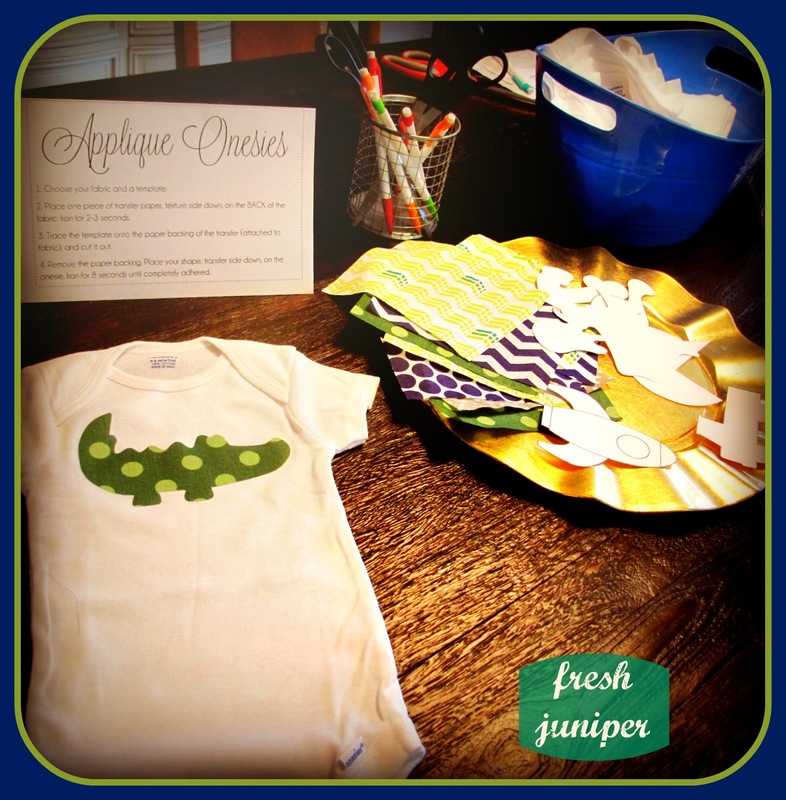 My favorite part was a simple DIY Onesie Applique Craft. What a fun idea! There were also scissors, pencils, and iron on adhesive with paper backing. 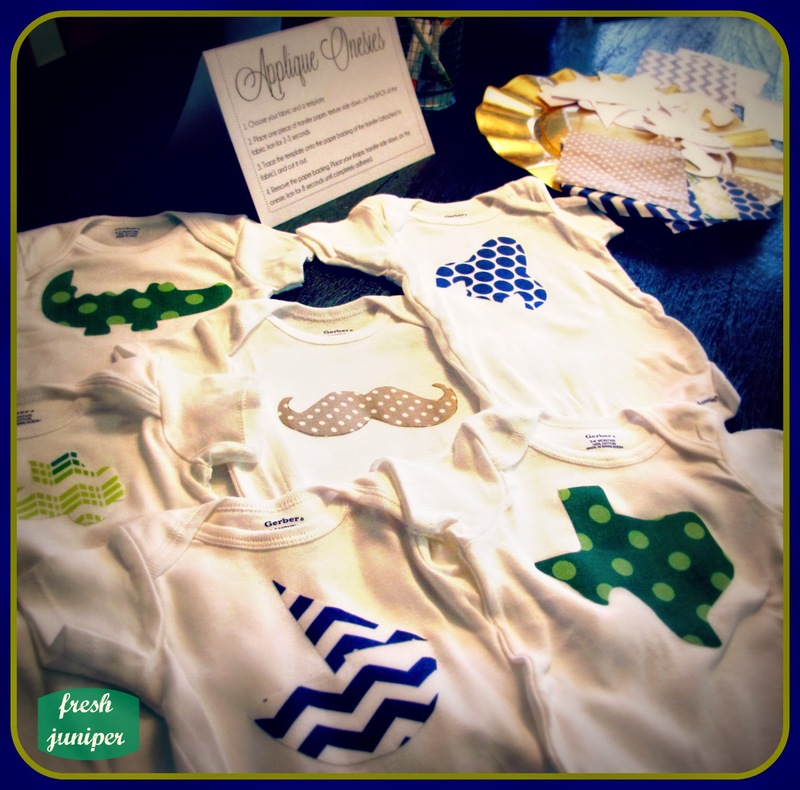 Each shower guest was invited to choose a printed cotton square, a template, and a onesie. 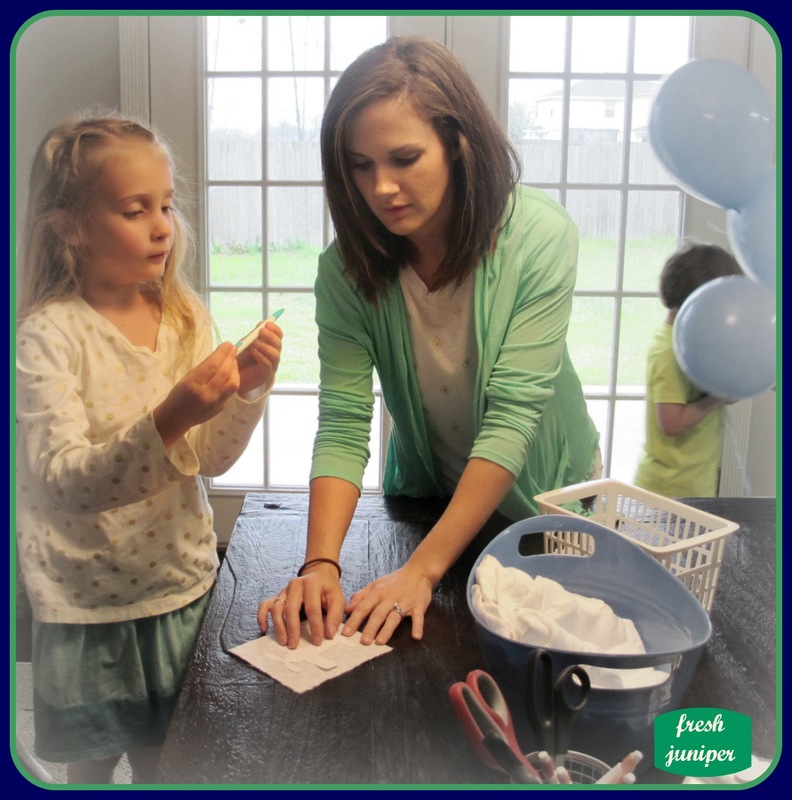 The hostess helped her daughter craft a onesie, too. Next, it was time to iron the square of cotton fabric onto the adhesive with paper backing. 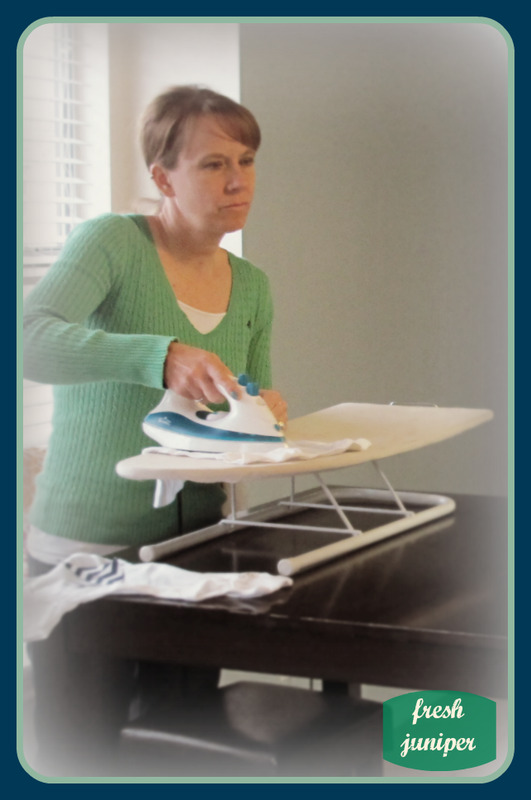 The ironing table was set up in the breakfast area, and the craft area was set up at the dining table. After the cotton fabric was ironed to the adhesive with paper backing, it was time to lay the cardstock template onto the paper backing and trace the design of the template onto the paper with a pencil. Then it was cut along the pencil lines and taken back to the ironing table and ironed directly onto the onesie. These are the designs we made. Mine was the grey mustache in the center. Everyone enjoyed themselves and the onesies they made turned out to be very cute. 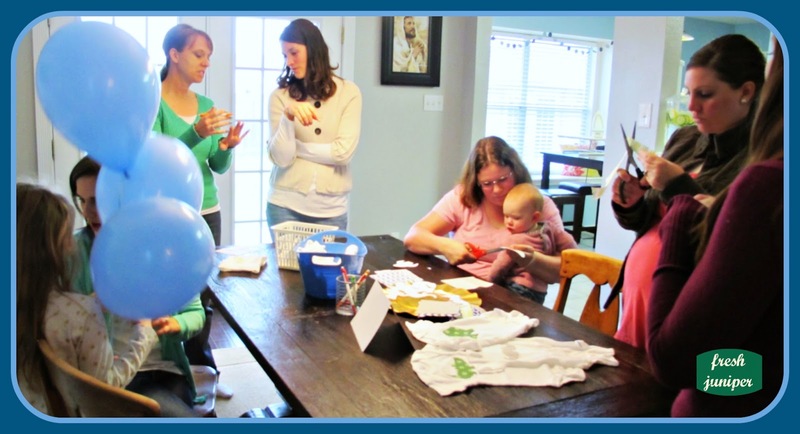 It was one of the best baby showers I've ever attended.